While most remain focused on the chaotic protests that have engulfed a number of foreign-invested areas in Vietnam, leaving scores injured and nerves frayed, the structural causes of the conflict are unchanged and will remain so until leaders of the two countries and other parties develop the imagination required to save the region from yet another dumb war. The people of both countries deserve better from both ‘socialist’ states. Any relief Beijing may be feeling today that Hanoi has scored an own-goal in with its mishandled and self-defeating efforts to encourage public expressions of patriotism will be offset over the coming weeks and months, as those who learn about the conflict realize how grandiose Beijing’s claims are. The test for Hanoi (beyond sitting again for the exam on public relations management) is to find a more effective way of making their case. This morning, I appeared on CNBC Asia’s Sqwak Box program. This hyper-linked clip shares mostly what I had to say (the clip can not be embedded). Yesterday I urged Vietnam’s state to immediately launch efforts to communicate their messages to the Vietnamese people and the world. This obviously needs to be done in a more thoughtful manner and it should, in my view, make use of some of Vietnam’s more junior leaders, who fluent enough in English to get the job done. 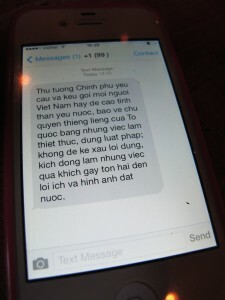 Late yesterday afternoon, Vietnamese officials sent text messages out (pictured here) urging people to express their patriotism and resolve to protect Vietnam’s “sacred” maritime areas and EEZ while calling on them to do so in a law-abiding manner and in ways that avert being high-jacked by criminal elements. While “too little, too late” certainly seems to have been lost in translation, this is the first of many, many efforts that Hanoi will have to undertake to (1) address the damage it has done and (2) refocus the world’s attention on the underlying conflict, for that conflict will simply will not go away. Visit the companies affected most by the recent riots and issue real (formal if necessary) apologies for the incidence; Assure foreign investors that Vietnam government will assist in providing companies immediate and timely aid to recover their production as swiftly as possible as well as guarantee that such incidents will not occur again. Organize meetings with Vietnamese workers to explain to them what has occurred and what is being done to address the issue in a way that speaks to the concerns of both workers and management; while instructing local authorities to address the needs of workers and employers at present and moving forward. This is an ambitious agenda but it is one that must be under-taken with zeal. We have seen the Vietnamese state perform well in some area (e.g. disaster evacuation); here is another area of utmost importance and urgency. Finally, I will add that this morning I was pleased to meet the Honorable Felix Chung, who is a member of Hong Kong’s Legislative Council, representing the textiles and garment sector. He told me he would be going to Hong Kong’s Vietnam consulate today for discussions and assurances. I told him I would be happy to facilitate meetings in Vietnam or help in any other way. Trained in comparative international development, I have never been a huge fan of the apparel industry. But what can I say, the apparel industry needs Vietnam and Vietnam needs the apparel Industry. With respect to point 2, i.e. the bigger picture, I was encouraged to learn that a working team from Beijing will be heading for Hanoi in the next days. Hopefully they will provide constructive proposals, rather than simply threats. Joint sovereignty proposals need to be explored and hopefully soon will. Otherwise we are in for a long, depressing-ride that will inflict untold pain on the region. I have never directly experienced war and nor would I care to. I hope others feel the same and work to holding Beijing and Hanoi’s leaders to account. For the past few days, in protesting against Chinese Communist Party and its government’s violation of Vietnam’s sovereignty, demonstrations of workers in several factories in Vietnam have gone overboard. (While patriotic displays were encouraged in some areas, the chaos that ensued was) spontaneous and unplanned, and (not the result of) extreme nationalism. It could happen when workers work under dire conditions and could not trust their own labour unions. Worker riots working for Apple in China is one example. Crowd effervescence can divert from its original peaceful purpose. The problem is, under the banner of nationalism, such under-regulated (mobs) have destroyed several international factories in Vietnam, not just Chinese but Taiwanese, Korean and Japanese ones. Several Chinese and Vietnamese were hurt. 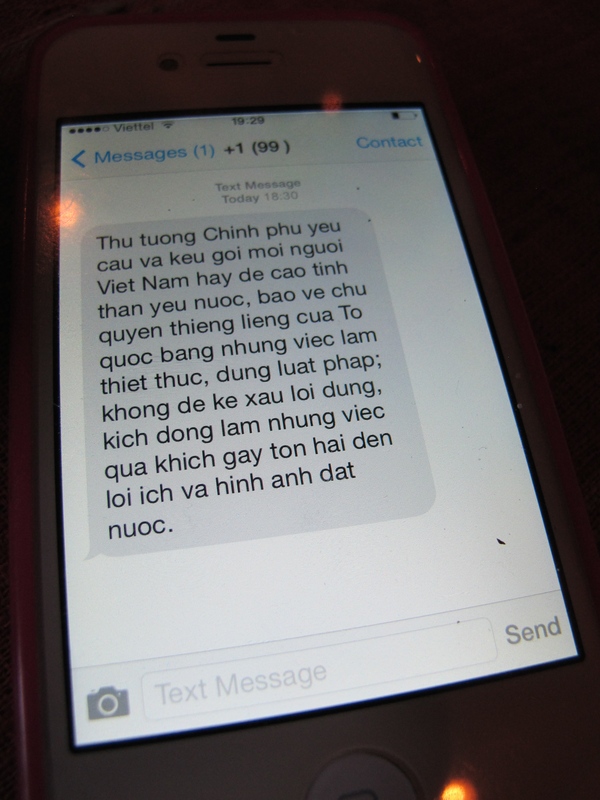 Many of my Vietnamese friends and I feel very sad about this. We just want to express our sincere apology for this bad incident. We really need your understanding. Special apologies go to Chinese people living and working in Vietnam.